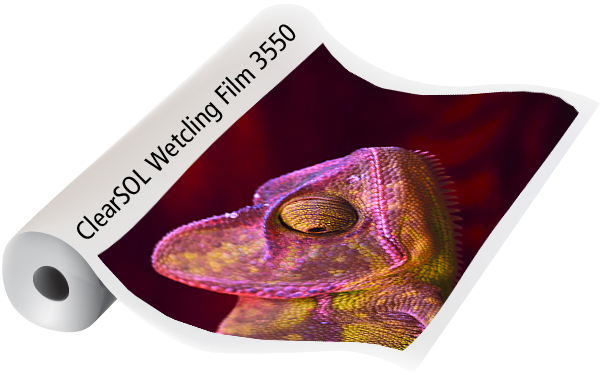 ClearSOL WetCling Film is a unique, super clear, 5 mil polyester film for solvent inks. The water-activated adhesive creates an instant bond on glass, acrylics and other surfaces. Graphics are printed on the adhesive side of the product and are protected by the polyester film and window surface. Can be used as a standard clear film. Specially formulated coating makes it a wet-cling film. Product does not have a release liner. Easy to remove with little to no adhesive residue. Produces high color images with solvent inks. Compatible with Solvent, UV and Latex ink printers (latex inks must be cured before installation). Ideal for window advertising and glass case displays.